I absolutely love this pattern! Darleen Hopkins’ Picture Perfect Baby Blanket. This must be the fourth one I’ve made. This time in Slytherin colors using Simply Soft. It has a beautiful drape and makes a perfect floor time play mat or stroller blanket. Two years ago I made this little guy’s big brother a Gryffindor blanket. It’s quick and you can easily adjust the colors as you like. I like adding more main color rows between the contrasting color rows. 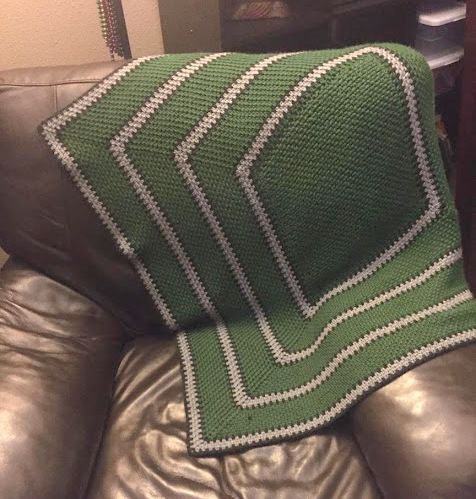 This make a great lap blanket in your favorite sports team colors. I’ve made a couple of Seahawks afghans and I suppose I should do a Packer one for my brother.